I had gotten to my meditation spot for zazen, lit a stick of musk incense and sat on the black zafu pillow cross legged, set a timer and began. This is the usual format for my sitting meditation, but sometimes the cat comes into the room. Now I used to find this distracting and it's also good practice to do zen in the midst of things going on around you, but now I see my cat's entrance a little different. Fiona is my cat's name, A.K.A. Funny Bunny because she's mostly black with one white hind leg as if she has a lucky rabbit's foot. 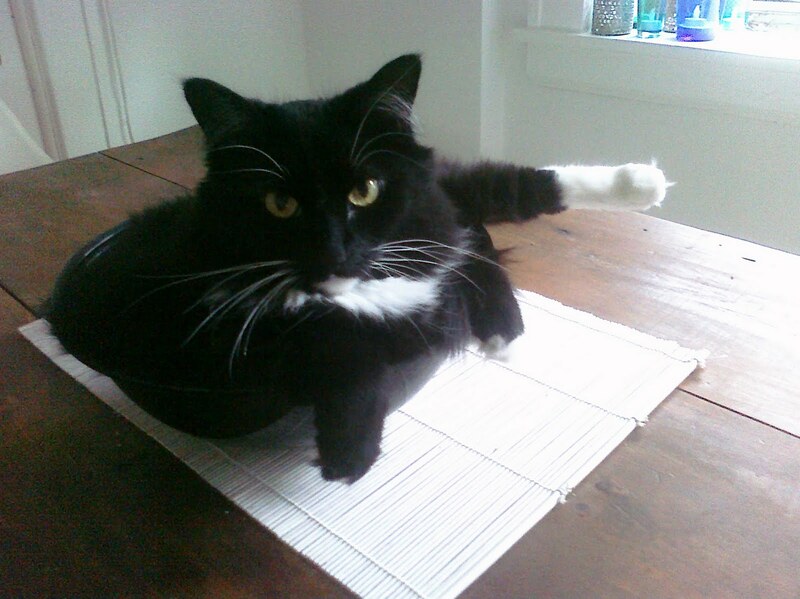 She spends most of her day sitting in an empty plastic salad bowl. She sits right in the middle of it like a big bowl of fuzz, sometimes with her rabbit's foot sticking out. When I see her it reminds me of the zen saying to "empty your bowl." Cat: Hi, what are you doing? You're sitting still on the floor. Me: I'm practicing zen here so beat it. You're distracting me. Cat: We'll I've been doing sitting around all day. (sigh...) I'm gonna explore the room for a while. Me: Your ruining my zen time. These feline visits got me thinking about my practice and how my mind reacts to the experience. First there is the sensation of touch when she walks by and my mind thinks "fur" and then "cat" then to "she's going to bother me" to "do I need to be on guard if she tries to take a swipe at me." The next sensation is sight by which I see and think "Fiona Cat," then one thought leads to the next and to the next. The zen practice here would be not to label the experience. Let things happen without your mind jumping to describing and categorizing. It's not direct experience anymore when doing such thought. Very difficult to do. Reel yourself back in. Thinking of what "could" happen with the cat in the room is not being present either. She wants to be pet. Well, like a Bodhisattva, I do not want to neglect her. I want to show love and compassion for all beings and in cat language, petting does the trick. I also think of action and reaction. She's letting me know that she's saying hello and I should return the greeting. She acts, I react. If she somehow gets angry of my stillness and lerches out with a quick sharp clawed paw, I lean back in reaction like a Judo master. I extend my hand breaking the sitting pose and mudra hand position and pet the cat a couple times. Back to my position. Spontaneity is a key point in Zen. The thing here is to be clear in mind before, during and after the action/reaction experience. No thinking. Naturally React. Empty your bowl. The cat sits upright in front of me closing her eyes slowly. Look at her posture, she's in her own zen pose! She reminds me to check my posture. Straighten up, chin tucked in a bit, no wobbling on the cushion, eyes partially open. Thanks Fiona. Her tail moves back and forth in a constant random movement. This is a true Zen moment. Does the cat think about it's tail and how to move it? No, I doubt it. The tail's movement is another form of it's body language too. Watching the randomness of the her tail movement helps me not to settle my mind into predictable patterns. To me here it's just movement. The cat rustles around the clutter in the room and then leaves unnoticed. Again, instead of saying in my mind "what's that sound?," "what is she getting into?" and then imagining all sorts of things from there that the cat could be doing, just let the sounds themselves penetrate. Instant sound without the reverberated thoughts that follow. Like clouds that come and go across the sky. Like our thoughts that come and go. Like a mirror that reflects an object but doesn't hold the image once the object moves past. Non-attachment. Lastly, there is no cat. This is the non dual philosophy of no "other." When we live with the perspective of Oneness we realize that all things are interconnected, ultimately making them one thing. An organism cannot come to be and live without it's environment. The conscious mind opens it's eyes to the world that is it's self. It originally sees the reality of things as they really are before ego gets involved. The great cause of suffering is the belief that we are separate. We are all One but don't realize it. My meditation is a practice on being present. Being with the reality of now without assessment. Just sitting, with cat. Without words, communicate (and commune) with your cat. Though I'm not accredited as a meditation teacher, I'd give you at least 80% credit for quality time spent with your cat as compared with sitting alone.